Skin Health was designed to be the ultimate skin health, anti ageing & DNA support supplement. It contains your daily multi vitamin and minerals PLUS Marine Collagen, Hyaluronic acid, Omega 3, Reservatrol, Grapeseed extract, Green tea, Glutathione, CoEnzyme Q10 and Garlic. Taken daily it will ensure that your skin gets the metabolic building blocks and essential micronutrients that it needs to stay young, vibrant, healthy and to withstand the ageing process. 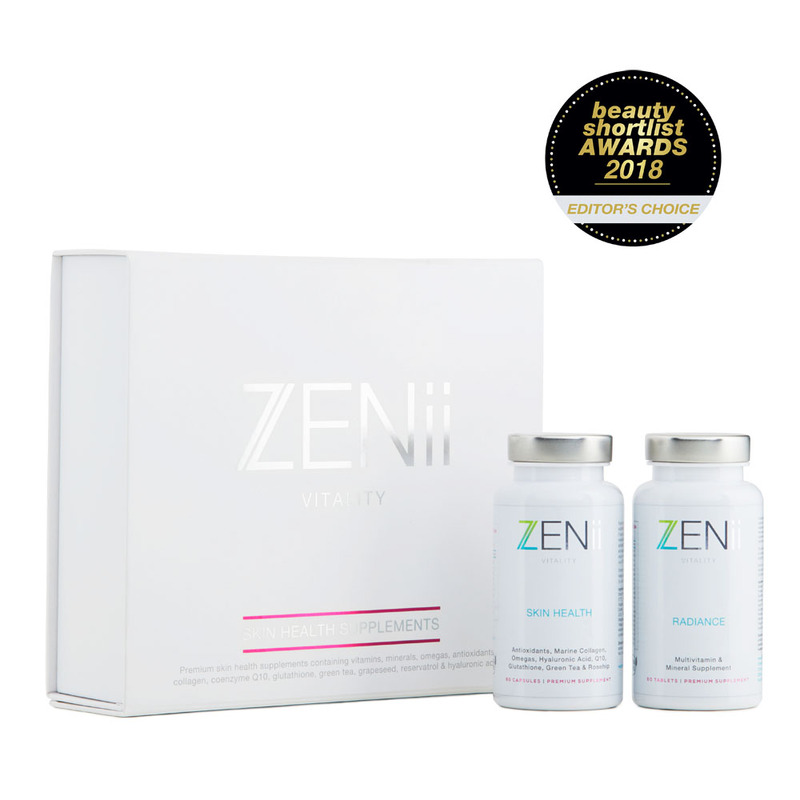 At ZENii we believe in nourishing the skin from within. That’s why we have formulated this wonderful skin health & anti-ageing nutritional supplement. 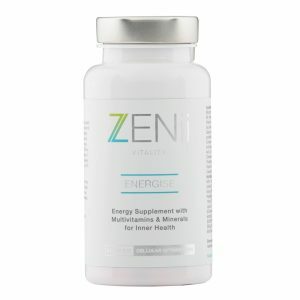 Everything you need for optimum cellular function and skin vitality is contained in this fantastic supplement. It is your daily multivitamin & minerals PLUS Omegas, Antioxidants, Marine Collagen, Co Enzyme Q10, Glutathione, Grapeseed, Green tea, Reservatrol & Hyaluronic acid. Taken daily it will ensure that your skin gets the metabolic building blocks and essential micronutrients that it needs to stay young, vibrant and healthy. There are 2 types of skin ageing. Intrinsic ageing and Extrinsic ageing. Intrinsic ageing is that which is determined by your genes and DNA. It happens no matter what you do and will happen inevitably over time. It is ageing that is predetermined and which you cannot fight against. Extrinsic ageing however is under our control. Extrinsic ageing is ageing which we can protect ourselves against. It is ageing due to environmental exposure, pollution, smoking, toxin exposure, free radical damage, poor dietary choices, alcohol, stress & cellular deficiencies. Extrinsic ageing can be minimised by the choices we make each and every day and the way we choose to influence our cells. This beautiful Skin Health supplement will help you minimise your extrinsic cellular ageing and will help to limit the impact that your environment and lifestyle choices have on your skin. We know that antioxidants, for example, protect your cells against accelerated ageing by neutralising damaging free radicals. We know that fish oils can help boost your skin’s ability to fight inflammation and help restore to your skin’s barrier function. A well functioning skin barrier keeps infections out and maintains resilience against pollution and other environmental toxins. Hydrolysed marine collagen helps to support skin hydration & elasticity and reduces the appearance of fine lines & wrinkles. Vitamin C helps to support maintenance of normal collagen and skin. Vitamin D protects against systemic inflammation and strengthens your immunity. In short, this supplement can help boost your fight against ageing and cellular decline..
Vitamin C – Humans cannot manufacture this vitamin so it has to be taken daily in the diet. Vitamin C helps support the normal function of collagen in the skin, plus its one of the most proven & researched anti-oxidants. Vitamin D – This super vitamin is actually a hormone. It is a chemical communicator between many different types of cells and functions to keep bones strong, the heart protected, prevents neurological decline, promotes systemic anti-inflammation and is a general all over power booster. Vitamin D deficiency affects up to 70% of Brits. Ensure you are not one of them with a daily dose of 1000IU. Zinc – The WHO estimates that 1 in 3 of us are zinc deficient. Marine collagen – hydrolysed types 1 & 3 collagen are known to be the most bioavailable for the skin. Marine collagen helps support your skin health and helps improve hydration, elasticity and fights against the mechanisms of skin ageing. Hyaluronic acid – is a powerful skin humectant that helps rehydrate the skin by drawing & binding water into the cells. Omega 3 – one of the huge nutritional deficiencies in the Western world. Omega 3 is essential for skin barrier function and skin health. Skin cells are made up of a fatty membrane and your body needs adequate intake of these essential fatty acids in order to maintain membrane function. Excellent for anyone with dry or dehydrated skin and for general anti-ageing. Green tea – a powerful elixir and antioxidant, loved for its anti inflammatory polyphenols and its ability to neutralise damaging free radicals. Grapeseed extract – is rich in Oligomeric Proanthocyanidin Complexes, potent and highly powerful bioactive plant compounds and antioxidants that provide a whole host of health benefits. Studies have found that OPCs, promote the synthesis of glutathione, the master antioxidant, which protects and strengthens DNA strands. Take one of each capsule per day with a meal. Consult your Doctor before starting any kind of supplement regime. Do not take if pregnant, breast feeding or without consulting your Doctor if you have significant medical history. Supplements are meant to be used alongside a healthy and balanced diet and regular exercise. Do not take if pregnant, breastfeeding or if you have a medical problem without consulting your healthcare provider.